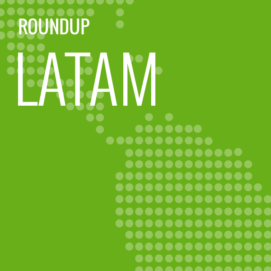 In this week’s LATAM Roundup: Latin America leads digital advertising revenue growth, according to the latest Magna Report, even though Peru is one of the few markets with negative growth; Teads increases reach in Brazil, providing 91% of the population with internet access; and ReachLocal ends 2017 incorporating two digital marketing operations in Brazil, growing revenues by 44%. A new Magna report presented earlier last week forecasts that digital ad spend will grow 9.9% in 2018 in Latin America, which is the fastest-growing region compared to other markets. 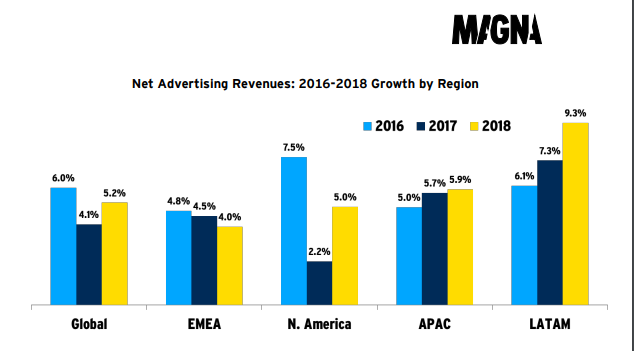 Globally, ad revenues are expected to increase by 5.5% next year, compared to 4.2% in 2017. 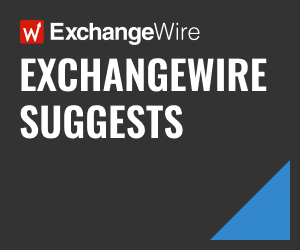 Worldwide events, such the FIFA World Cup in Russia, the Winter Olympic Games in South Korea, and the United States elections are named to be the most important ones for the sector. Despite being the fastest-growing region, one Latin American country is one of the five markets which had negative performance in 2017: Peru. Argentina is the market with the fastest growth rate (24.7%). Alongside Latin America, Central and Oriental Europe (7.2%) and Asia-Pacific (5.9%) are on the top of the ranking when considering growth of digital advertising. The bad news came from Europe, which is expected to see the market shrink by 2.7%, given the political uncertainties in the United Kingdom because of Brexit negotiations, not to mention the Spain and Germany economies. Next year, India, Russia, and China should lead digital advertising spending, with 12%, 10%, and 9% growth, respectively. The Brazilian economy is slightly recovering, according to the country’s official numbers and, in the meantime, the digital advertising market takes advantage of brands wanting to optimise their budgets. This current scenario, according to Teads Brazil, contributed to a great performance in 2017 – closing out the year by growing its operations by 150%, and achieving 1.2 billion people monthly in their audience reach. This represents 91% of the Brazilian population with internet access, up from 52% of coverage in the beginning of the year. The performance follows IAB predictions that digital advertising should keep growing faster than the overall ad market, expected to increase by 26% in 2018. Teads Brazil also grew its local team, which now has 19 people hired with a diverse background in the industry, from bigger traditional advertising agencies to tech companies. The expansion, on top of the current moment of the country, was also attributed to important partnerships signed in the country throughout the year, such as Abril Publishing Group, Webedia, Estadão, Lancenet. In total, the company has 200 partner websites. ReachLocal Brazil, an ad company which is part of the US-based Gannett Company Group, ended 2017 growing its revenue by 44% as a result of completing merging the operations of Planeta Digital and Bidsmart. Both companies handed over their digital marketing accounts to ReachLocal’s control, now responsible for managing, billing, and attending to all clients in Brazil. According to Proxxima, there are around 4,000 Brazilian companies in the portfolio using tech resources for their digital campaigns. Even though the company is known for its work with small and medium-sized business, ReachLocal also attends big brands and has consolidated operations in five Brazilian cities and three Latin American countries: Chile, Mexico, and Argentina.